At Junkies, we often get to hear of people who battle all of life’s odds to achieve remarkable outcomes. We met such a remarkable person in 2017. Since launching her brand in 2016, Gemma Vendetta has built a cult following for her natural and chemical free beauty products. We caught up with Gemma and she shared her story with us. Hello! My name is Gemma Vendetta and I'm a Pro Hairdresser and Makeup Artist, Full-time Single Mother, and Entrepreneur from Adelaide, South Australia. 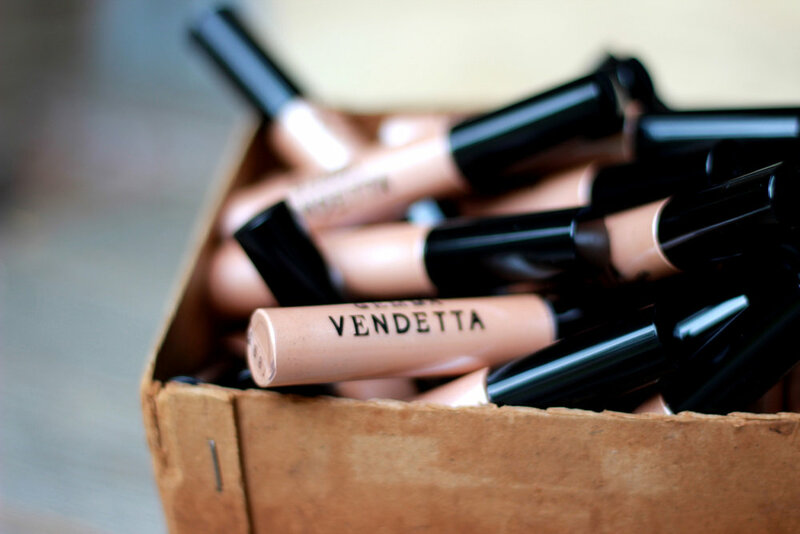 I'm the founder of Gemma Vendetta Cosmetics: 100% Australian made and owned, high definition, safe, gender-neutral, certified vegan and cruelty free mineral cosmetics. In 2007, I was diagnosed with Multiple Sclerosis, a degenerative neurological disease of the immune system. Basically, my body is attacking itself. After diagnosis I began researching healthier options in all aspects of my life; cosmetics, beauty and mental health. After doing hair and makeup as a hobby, I decided to validate my skills and become a Pro. As a newly qualified professional hairdresser and makeup artist, I was shocked and dismayed that this mainstream industry seemed satisfied using, and recommending to their clients, products that are laden with chemicals. These are the very chemicals that disrupt the immune system. So I used myself as a guinea pig. I changed my diet. I focussed on my health and wellness. I took my diagnosis as an invitation to disrupt the industry from within, by creating my own range of safe, yet professional, mineral cosmetics. I'm proof that making small changes over time has its benefits, as I'm now 11 years without a relapse, and three years 'clinically stable' (meaning the disease has not progressed). Not only are your products natural, they are cruelty free as well. Why is it important that your cosmetics are vegan? Anyone with any empathy and heart will see the blinding importance that all creatures are worthy of a healthy and happy life. Testing on animals is an archaic and barbaric practice. I love animals, I see no need to test on animals, and I pledge that none of my products will be tested on animals, nor sold into countries that test on animals. Not ever. I believe in ethics over profits! I have kept my range succinct and simplified so as to remove the pretension surrounding the makeup and beauty industry. You don't need to wear a full face of makeup to feel and look your best. Keeping it simple works, but if you do love a full, high definition coverage, my products will do that, too. I have five Pressed Mineral Foundation shades, and, to further diversify my brand in the market, five BB/CC Cream shades. I am often hearing humans of brown complexions find it difficult to find appropriate shades for their skin tones – sample packs are available via the website. I also have eight vintage reproduction lipstick hues; a liquid mineral highlighter than can be mixed with the BB/CC Cream for a dewey-look; a 14g 2:1 Bronzer/Blush; and two brand new blush shades, too. I have two pressed eye palettes: one for 'day/natural contour' and the other for 'evening/smokey'. I also have a nourishing Jojoba Black Mascara and two 'must-have' vegan makeup brushes to compliment the range. I want to take this opportunity to send out an abundance of gratitude to all my existing supporters, to Junkies for their belief in my brand, to you reading this, for sharing our ethos' and for making small changes for the greater good.